Croydon's £1Bn town centre redevelopment has been granted outline planning permission for a 1.5 million sq ft scheme that should start on site in 2015. 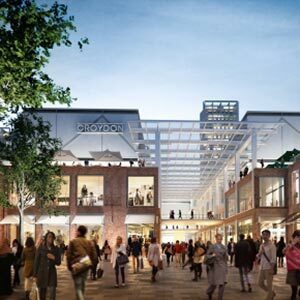 Developers Westfield and Hammerson who each own part of the site ended a long period of wrangling over rival schemes earlier this year and combined on the plans that were given approval by the London Borough of Croydon last night. The partners also intend to refurbish the adjacent 500,000 sq ft Central shopping centre for which planning permission has already been granted. The project involves retail, leisure and restaurant units, new public spaces, car parking and up to 600 apartments. The developers, calling themselves the Croydon Partnership, have agreed to pay £15M to develop the Croydon tram network, £10M towards local buses, £2.5M for local highways, £1.62M for sustainable transport initiatives and £1.3M to support local employment and training initiatives. The plans now go before the Mayor of London before detailed designs are produced for approval next year. Westfield director of development John Burton said: “This is a significant step forward in our plans for the redevelopment of Croydon's retail town centre and importantly will create 5,000 new local jobs.